If you do not have a window seat, your visual travel experience slims down to advertisement stickers mounted onto the back of your tray table on your front seat. So, should on departure day, either you or one of your friends remain sober and without a hangover, it is absolutely worth considering to bridge the distance between Nevada and California in the most traditional way of traveling: By car. There is three main routes that lead to the City of Angels, depending on how much time you want to compromise on and what to see on the way. 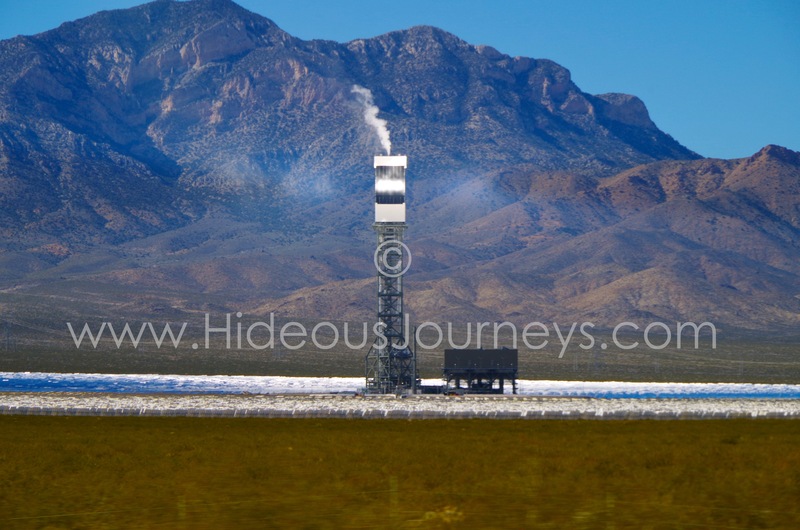 The first is passing Death Valley National Park. It includes a roundabout way northwestern first and leads all the way through the hottest place on earth. So it might be recommendable NOT to go during summer:). Another option is the Southern twist on Highway 95 until Blythe along the Colorado River Reservation. From there, the Interstate 10 takes you past the Joshua Tree Monument, Palm Springs and the San Bernardino National Forest. A fantastic route if you have time to add at least another overnight in-between to explore those sites without haste. The third route is, compared to the scenery of the other two, probably the more boring one. 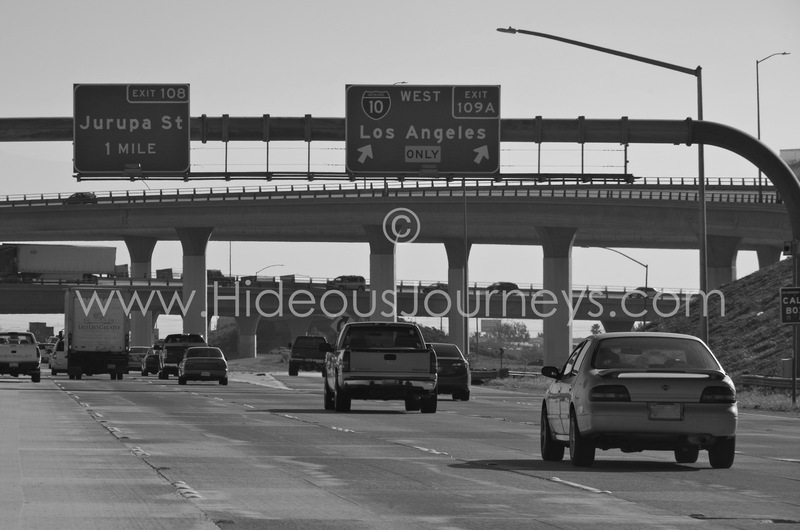 But, it is not only the quickest (around 4 1/2 hours with no traffic) way to Los Angeles, you may also find some great discounts on designer brands along. And to make this quite stereotypical, guess which direction we went? One thing, that MUST be included on any departure from Vegas (if you have not done it before and no matter which direction you decide on driving), is to stop for a souvenir photo at the world-famous Las Vegas sign. Some blocks further South, and still on the Strip, you may call in at the first premium outlet mall. But no worries, since there are more to come, don´t feel bad to leave this one out. 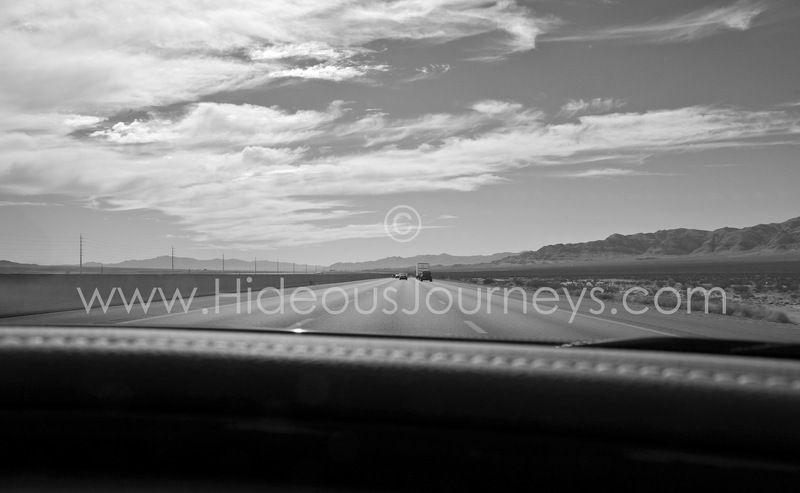 After you see the impressive skyline of Las Vegas vanish in the rearview mirrors, you´re well on your way down Interstate 15, southbound. Next stop is the Las Vegas Fashion Outlet right on the border between Nevada and California. After close investigation, it is time to move on. 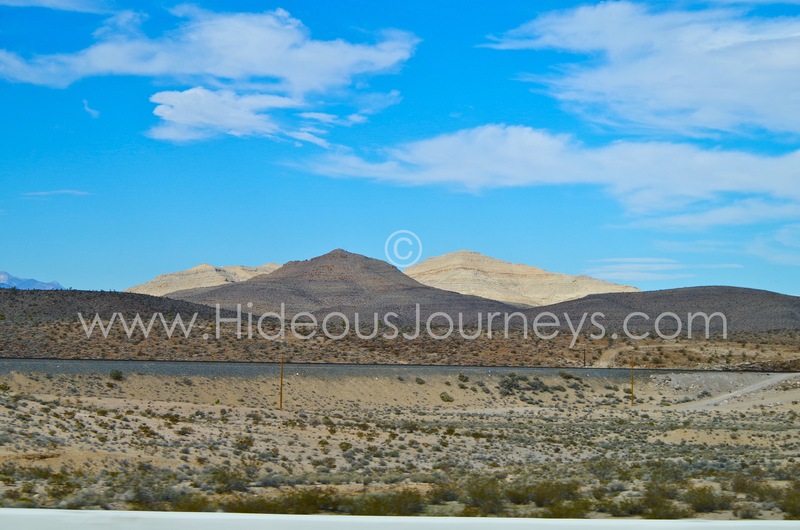 The Interstate 15, also called Mojave Freeway, winds itself through valleys and over hills. Passing deserted villages and endless plain. Perfect to activate Cruise Control, have a Soda in your hand and the radio on high volume. Moments of freedom and thoughts of early settlers arise. A little after you pass the Yermo Border Station (the official border control between Nevada and California), stop by for either a full meal or just a monstrous milkshake at Peggy Sue´s 50´s Diner. But don´t stay too long. Time is running. 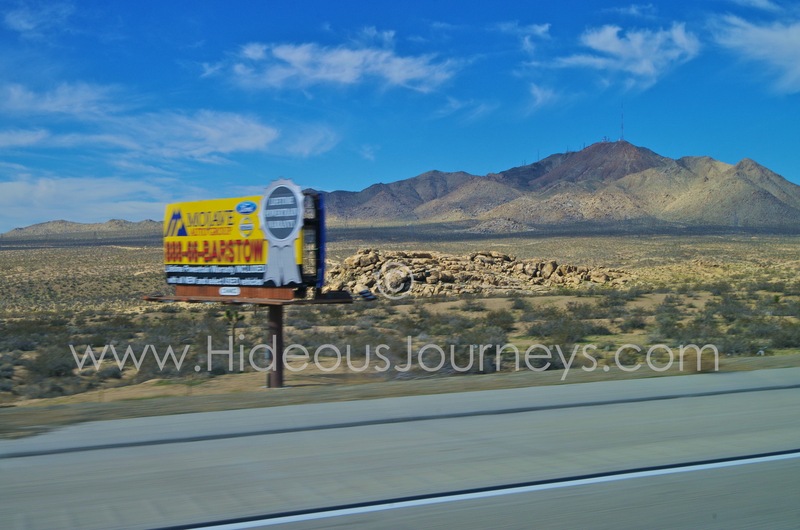 Just a little further down I 15, right behind the town of Barstow, you will find the Tanger Outlets on the left hand side. Again, since the best thing is yet to come, do not waste too much time here. The Reebok Outlet might be worth a try. And, of course, there is free WiFi. Next opportunity for shopping is Victor Valley. It is advisable to check the offerings online first to find out, if a stop is worth it for you. Since it is “just another” mall along the way, most shops and brands repeat! We are getting closer to our outlet shopping hotspot though. 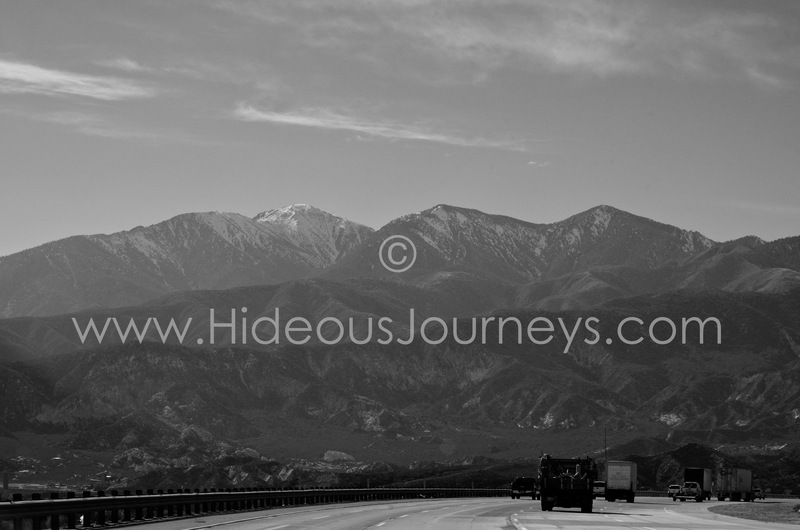 As the highway winds itself through the rocky Angeles National Forest, snow-covered mountain tops glitter in the late afternoon sun around us. Getting close to L.A. Snow cap mountains at the Angeles National Forest. 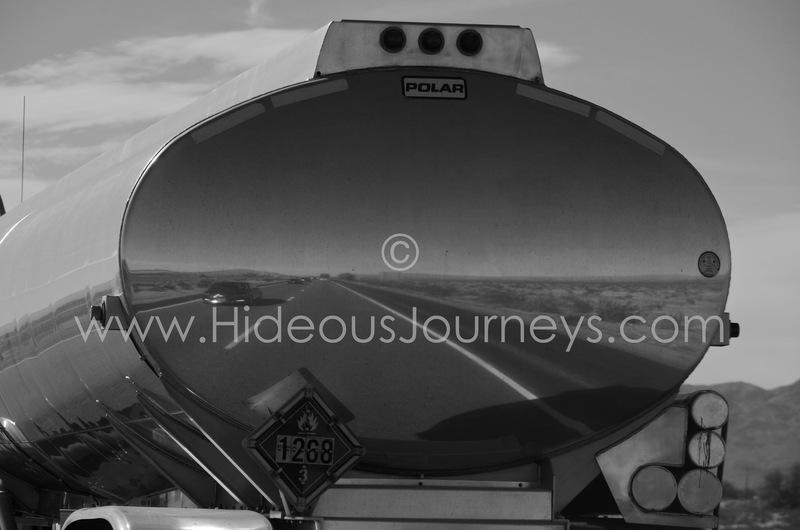 Right after the mountains, we follow I 15 South until Exit 110. This leads us almost directly to the place that we wanted to visit right from the beginning: Ontario Mills. This enormous outlet features many, many most popular brands such as A&F, Asics, Calvin Klein, Kenneth Cole, Lacoste, Michael Kors or Nike (just to mention a few). It closes at 9pm, so make sure to leave Las Vegas best around nine or 10am. As the area is huge, calculate at least three hours for your visit there. For energy reloads, you may also find a large Food Court available. Now it is time to relax. If you finished your stay at Ontario Mills, there is no more need to rush at all. Traffic around Los Angeles is bad at any time of day. So prepare to spend more time in your car to your final destination, than you have calculated. So make yourself comfortable in your seat, grab a coffee at Starbucks and turn up those radio tunes. Next stop is the City of Angels! To be honest, depending on how successful you are on bargaining, flying might be the less expensive way to get to LAX. But hey, quality time on the road and a few discounts are definitely more fun, right? Drive safely, folks! And don´t forget to take water, a full battery on your cell phone and your credit card.